Paint radiates personality throughout your home, so you want to choose your home’s interior and exterior paint colors wisely. Your bathroom remodel needs colors that will inspire a spa-like retreat. Your ‘new’ master bedroom should feel like it’s cut off from all stress. You can keep your children’s imaginations running wild with vibrant colors that easily transform playrooms into play lands. Here are some ideas for your home painting project. If you’re choosing exterior colors, look to complement your lawn as well as the period the home was built in. Stay one step ahead of elements you can’t control: A vibrantly-painted home in a sun-drenched area may quickly pale, and a white exterior in a polluted city will become dingy. Choose paint colors to complement your belongings. For example, a pale yellow rug will complement lilac walls. Bold, red accessories will create pops of color in a room covered with light green. A roughly-hewn shelf may create bold contrast with the stark white wall it’s going to be attached to. Did you know DFW Improved has a design showroom? Make an appointment and our interior designers can help you plan your remodeling project. 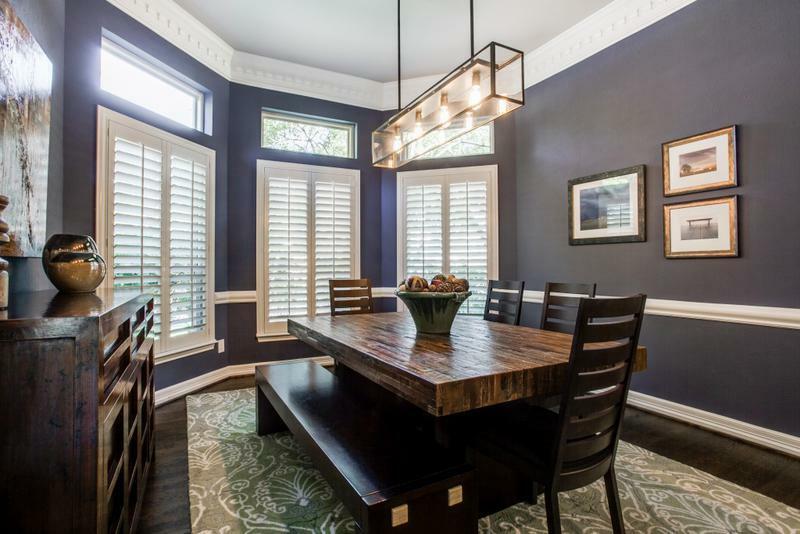 Add some white to the trim, like the dining room pictured above. It invigorates the space while keeping the room clean and crisp. Textures create statements. A newer home can look both charming and aged with the right wall texture. A sand texture can give your room a whimsical feel. Smooth walls may reflect more light, giving your room the sense that it’s larger than it appears. Furniture’s wood grain can be accented with a smooth or lightly-textured wall. A stucco-like room texture will make you feel as if you’re stepping into a rustic villa. If you’re looking to save money on your remodel, texture may be a way to hide imperfections in the wall, plaster, trim, ceiling, or drywall. Walls can contain more than one solid paint color. Painter’s tape can help you create an eclectic pattern of diamonds or zig zags across the entire wall or on stair risers. Patterned rollers and stencils are helpful along a border-sized area or even the entire wall. Painting techniques or specialty paints let you create wood grain, crackle, a mottled look — anything your heart desires! Make walls look higher with intersecting ones. Make walls seem wider with horizontal lines. Add contrast between the walls and ceiling. Separate large rooms into functional areas. Add depth to walls and ceilings. Remove the need for trim. Note: If you’re not bold enough to add patterns to your walls, use subtle paint colors and bring in boldness through accessories. Home painting needs strict attention from you and your contractor. Choosing paint colors and textures is time-consuming, but it isn’t impossible. A well thought-out plan will bring your remodel to the next level. Do you have home painting on your list of projects for 2016? Click here for an estimate on interior and exterior painting projects, or call us at 972-377-7600.